Laminated Prayer Card 5 pack: Mary, Refuge of Holy Love Laminated with the "Prayer to Mary, Refuge of Holy" on reverse side. Prayer Card Laminated 5 Pack: Prayer to Mary, Refuge of Holy Love. 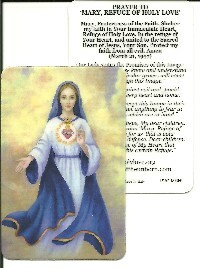 Image of Mary, Refuge of Holy Love with Prayer to Mary, Refuge of Holy Love on reverse side. Duplicated from original painting.